My husband and I love Mexican-American food. The more cheese, the better. 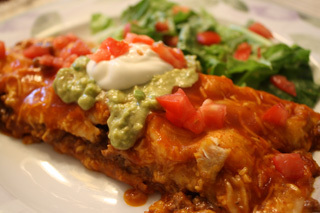 So it's always fun when mom invites us over to dinner for her homemade Mexican style meals! My mom makes these incredible enchiladas that have been my favorite for a long time. When she invited us over this time, I decided it was time for me to learn how to make them myself. Now I will pass this easy but delicious secret on to you! Brown the ground beef. Drain extra fat. 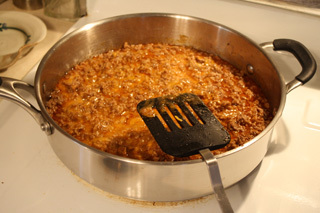 Mix in half of the large can of enchilada sauce and 1 cup of the shredded cheddar until cheese melts. Pour a thin layer of enchilada sauce in a 9" x 13" baking pan. Then hold the tortilla in one hand while scooping the ground beef mixture into the tortilla with a spatula. 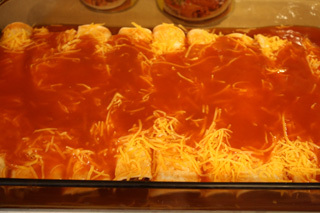 Roll up the tortilla and place on the sauce in the baking pan. 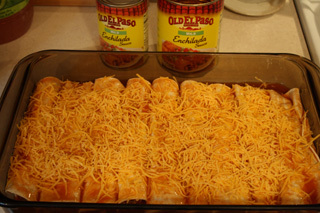 Makes 8-10 enchiladas depending on how much filling is used. Top the enchiladas with the remaining large can of sauce and the small can of sauce. Then sprinkle on the remaining cup of cheese.